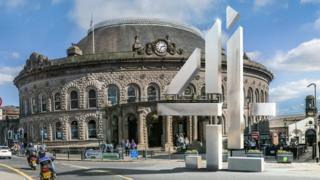 Channel 4's decision to move to Leeds could boost the local economy by £1bn, according to the leader of the city council. Judith Blake said about 1,200 jobs could be created over the next 10 years. The Labour leader said six television companies had subsequently announced plans to move to the city. Last year, the broadcaster announced it was moving its headquarters from London and transferring 200 of its 800 staff. Ms Blake told a council meeting the Channel 4 decision had generated "huge excitement", according to the Local Democracy Reporting Service. "We are already seeing the impact since Channel 4's announcement," she said. "A number of other TV and film sector organisations have announced relocations here, including UKTV, Wise Owl Films, Workerbee, Simplestream and PACT." The companies relocating to Leeds include the makers of 24 Hours in A&E, Red Dwarf and the Great British Singalong. UKTV has since confirmed its head office would remain in London, and the relocation referred to its opening of a technology hub in Leeds City Centre.